Total: 2 hr. 15 min. 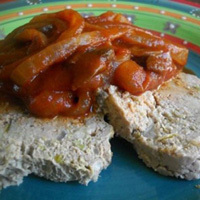 A variety of vegetables add extra moisture to this turkey meatloaf. Preheat oven to 350°F. Chop the onion, green bell pepper, celery, garlic, and mushrooms into small pieces. Add to a large bowl. Add meat, milk, bread, eggs, Worcestershire sauce, spices, and tomato paste. Either incorporate all ingredients well with your hands or use a potato masher. Put meat mixture into a bread loaf pan or shape into a loaf on a large cookie sheet. Cooking on the cookie sheet allows the fat to run away from the loaf. For the sauce, preheat a skillet. Drizzle with olive oil. Add onions and mushrooms. Sprinkle with a little kosher salt and sauté until tender. Add tomato paste, vinegar, Worcestershire sauce, spices, and water. Mix well and bring to a boil. Reduce to a simmer and let reduce and thicken until the sauce reaches the desired consistency. Put sauce on top of meatloaf. Cook for 50 to 60 minutes.